This book shows how to prepare and respond to any crisis, man-made or natural, wherever it might occur and however small or large it might be. Using what has been learned from previous disasters, this indispensable book illustrates how others survived past crises. Just as important as learning how to survive the worst is learning how to survive everyday emergencies ranging from bee stings, snakebites, and allergic reactions to house fires, gas explosions, and more. It’s all important, and it’s all in this comprehensive guide. Covering the basic needs from food, water and first aid to shelter, security, and self-defense, this informative guide walks readers through the steps it takes to create their own personal emergency action plan. It provides a catalog of the skills, tools, and items needed to endure and overcome a variety of situations and circumstances. It pinpoints hazards unique to different terrains, locations, situations, and settings, too, and it helps to identify and understand possible threats. Furthermore, the guide provides insights into how to react and respond when disaster does strike. Critical decisions faced during an emergency are considered: whether to stay or to go, where to go, how to stay informed, and more. Truly essential, this comprehensive guide takes a clear-eyed look at what to do should the worst happen. 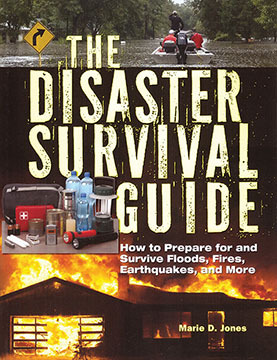 THE DISASTER SURVIVAL GUIDE: How to Prepare For and Survive Floods, Fires, Earthquakes and More By Marie D. Jones. 432 Pages. 7x10 Paperback. Illustrated. Bibliography. Index.